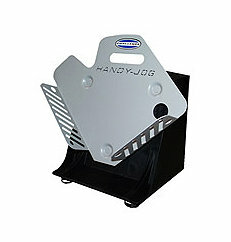 The Challenge Handy Jogger is a low cost highly effective paper jogger that fits everyone. A Paper Jogger is a document-handling machine that mechanically lines up a stack of paper or envelopes so all the edges line up perfectly. Paper joggers help save time when you have to quickly square-up unorganized stacks of paper. All you have to do is place the paper in the machine and the paper jogger does the rest. Paper joggers are used most in copy centers, print shops, binderies, and mail rooms. The Challenge Handy Jogger is available in different models, like: standard tray, large tray, or three bin check tray for an array of versatile jobs. The front-side loading tray can hold up to an 11” x 17” stock size. The Challenge Handy Joggers only weigh 15 pounds making them perfect for any office with limited space or mobility requirements. If you have any questions or are interested in purchasing the Challenge Handy Jogger, visit us at SpiralBinding.com. We have great pricing on a full line of Paper Joggers. Call us at 1-800-631-3572 for more information!